What to wear in your senior pictures? | KJay Photography in Madison! Fun and Creative Senior Pictures! We often hear our customers ask “what should I wear in their senior pictures”? KJay Photos Photography in Madison, WI specializes in high school senior pictures. We have partnered with Francesca’s Collections in West Towne Mall who assist our female senior portrait customers in selecting the right outfits for their senior pictures. 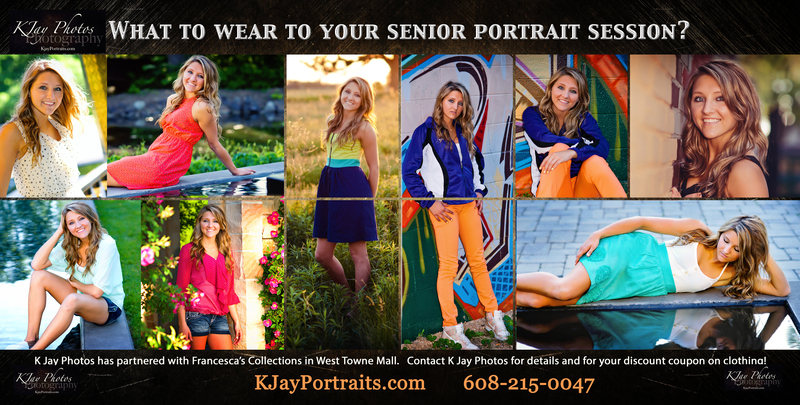 We even have a Francesca’s discount coupon for our senior portrait customers! Ask KJay Photos for details when reserving your senior portrait session. Sammie, one of our 2013 Senior Reps, took advantage of this service. She set an appointment with Francesca’s Collections and showing them samples of KJay Photos work. Samples of other photos taken in the same setting where her senior pictures would be taken. This helped Francesca’s Collections select just the right outfits out for Sammie. See for yourself below. Francesca’s noticed when Sammie arrived that she was a very fashion forward fun young lady. After talking with her they got a chance to see her unique style noting that she enjoyed bright neon colors with fun patterns. They chose outfits that were perfect for the settings that we photographed Sammie in offering a nice collection of solids colored clothing and prints. The jewelry was kept simple with a pair of statement earrings and no necklace keeping the focus on the face in the portrait. Sammie left with several outfits that she wore during her senior portrait session but also outfits that were summer staples that can be worn all season long and into the next few years. This entry was posted on May 30, 2012 by onwisconsin. It was filed under Francesca's Collections, KJay Photography, Madison Photographer, madison wi photographers hair, Madison WI Photography, Madison Wisconsin Photography, Middleton Photographer, Senior Pictures Clothing Tips, Senior Pictures Special, senior portrait packages madison wi, Senior Portraits High School Pictures, Verona WI Photography, Waunakee Photographer, where to take senior pictures madison wi, Wisconsin High School Senior Pictures and was tagged with Francesca's Collections, KJay Photos Photography, madison wi photographer, Senior PIctures what to wear, Senior Portraits Wisconsin, waunakee photography, West Towne Mall.